See our article titled Why Detect Occupancy? Card size: 2.75" x 2.75"
Compatible with active low input devices. Card size: 2.25" x 2.00"
Output mode: 3-output Type D: R/Y/G for each head - changes have brief dark moment. 2-output Type SA: R/G for each head (both provide Y) - changes between G and Y have red "flicker"
3-output Type SA: R/Y/G for each head - changes between G and Y have red "flicker"
Dual occupancy inputs: Occupancy inputs may use either two inputs (R-G) or three inputs (R-Y-G) - no jumper selection needed. With two inputs, approach indication is conveyed when both red and green are active. ABS operation mode: Jumper to enable basic ABS signalling logic to be performed on-board. Clear To" indications: CROR Rules 412, 413, 414, and 415 implemented. All these indications all have a flashing high head aspect. 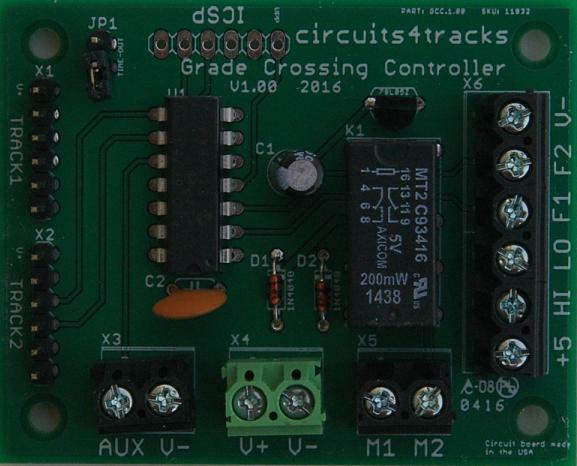 Card size: 2.50" x 2.00"
Inputs for two tracks provided. 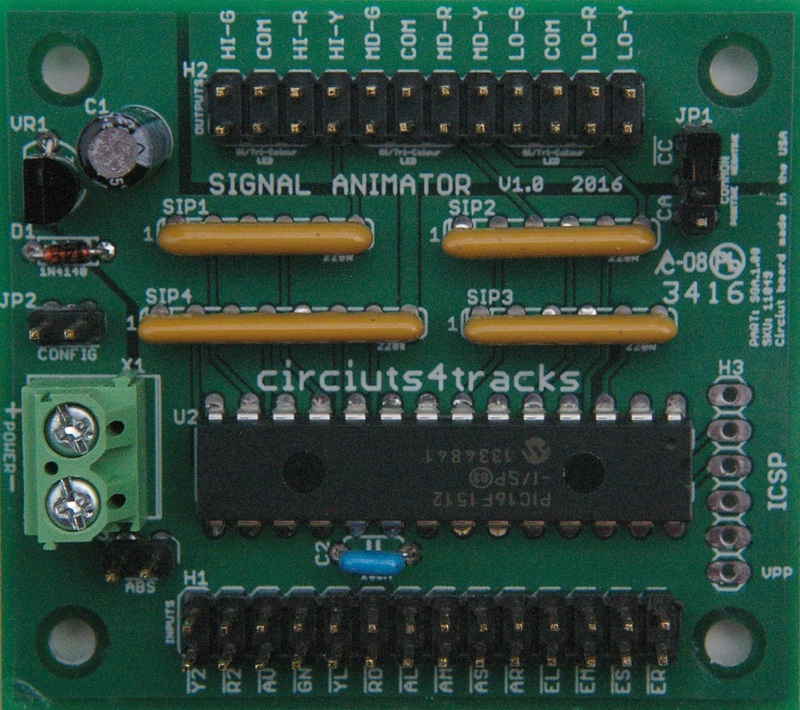 Additional tracks supported with additional GCC units. Available for both linear and loop operation. Card size: 3.00" x 2.25"
Power supply requirements: 12 volts AC, up to 1 ampere. Input power connector: Screw terminals. Detection input connector: 6-pin SIP header. Detection inputs: Four active-low inputs. Other input: One active low input to hold train at next stop. 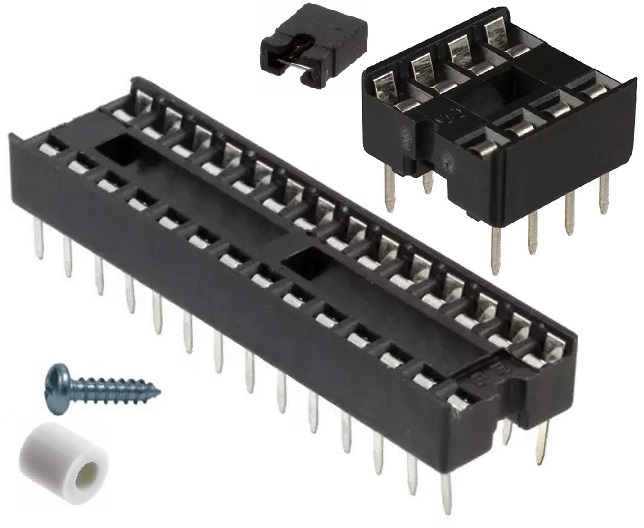 Track power connector: Screw terminals. 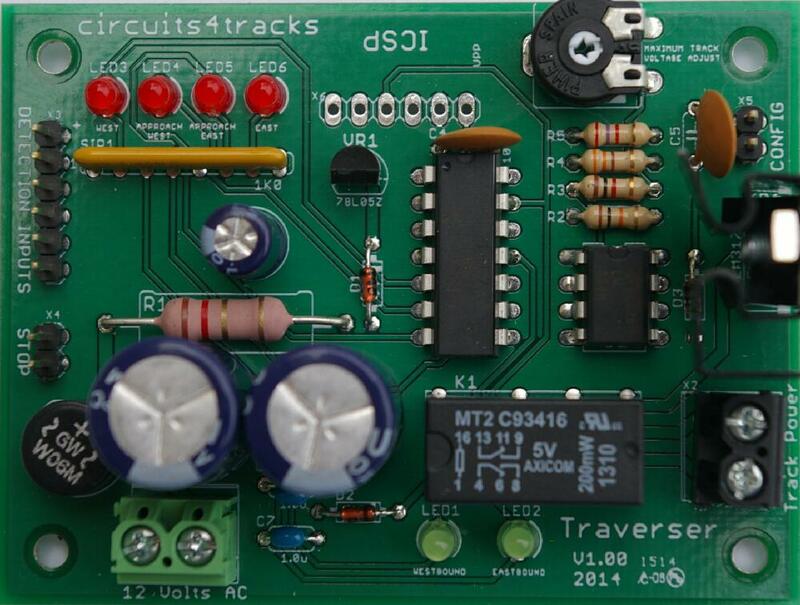 Maximum track output voltage: Adjustable from 6.5 volts to 11.0 volts (DC). Maximum track current: 1 ampere. Stop duration: Default of 2 seconds. Card size: 2.30" x 2.30"
Hardware: 3.00" x 3.00" powder coated aluminium panel for fascia mounting. Power supply requirements: May be powered from cab bus or separate AC adapter. Current draw under 20 mA. Display: 7-segment LED display. 4 digits; Red 0.4" high. One front panel RJ-14 connector for cab connection. 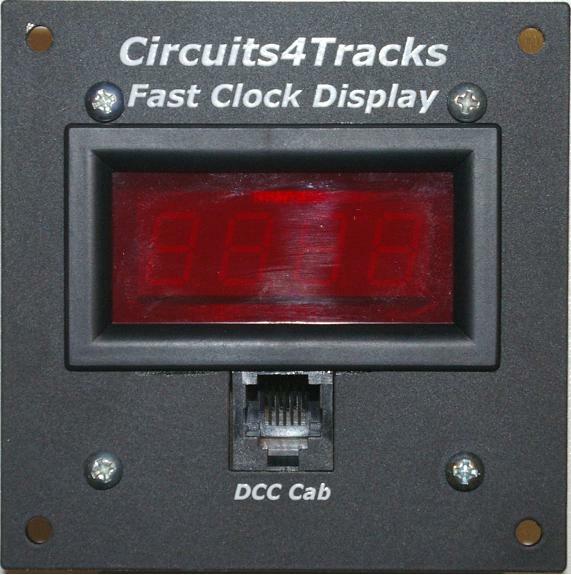 Included feature: Time/temperature function for on-layout display sign. Accessories for use with other products. This will be the product family of our Computerized Signalling System that is currently under development.